Genesis Publications, 1987. Deluxe Limited Numbered First Edition. Leather. Fine. West, Keith. SONGS: VOL I: A handsome Deluxe limited numbered first edition signed by the late George Harrison, formerly of The Beatles, and numbered 853 of 2,500 Limited Editions. Also signed by Keith West on a label on the front free endpaper. 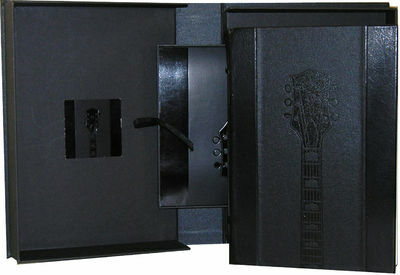 In 3/4 black moroccan leather with gilt tooling, gold gilt edges and a blind-stamped guitar on the front and back covers, and a silk bookmark with the same guitar logo as the front covers. Includes a CD (issued with either a CD or vinyl record) of 4-tracks with recordings from 1974-1980. The CD has been fully tested and is in perfect condition. In a black clamshell box with gold tooling and a gold-titled label on the front. In fine condition but for bumped corners. Includes the lyrics to 60 of Harrison's songs with beautiful art & illustrations by West. Includes one double-page pullout. 176 pp. A beautiful copy. This first "Songs" is quite scarce. 1987. HEPBURN, Katharine. THE MAKING OF THE AFRICAN QUEEN. 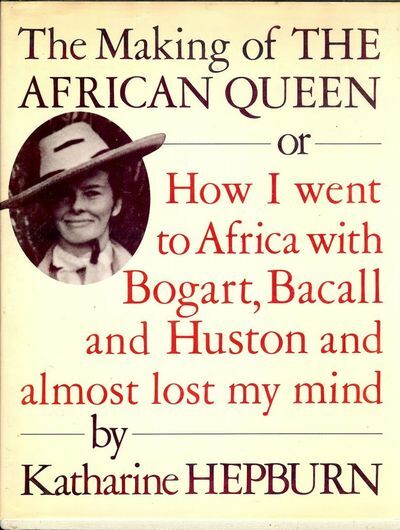 Or How I Went To Africa With Bogart, Bacall and Huston And Almost Lost My Mind. NY: Knopf, 1987. 8vo., cloth & boards in dust jacket. First Edition, first printing. Nicely signed by Hepburn on the half-title page. This is Hepburn's first book and is quite sought-after when autographed. Near fine in dust jacket. $685.00. CHINESE PORCELAIN THE S. C. KO TIANMINLOU COLLECTION. SUPERB & STUNNING COLLECTION OF FABULOUS CHINESE PORCELAINS Hong Kong 1987, - Hong Kong Museum of Art. Black cloth, 2 vol.set: 364 & 240p., 400+ color plates and illustrations, 59panoramic views, cloth slipcase, excellent condition, 25.5 x35.7 cm. small folio. FIRST EDITION Color scans available for this book on request. Description content 2016Copyright Rare Oriental Books Co. The Western Lands. [Inscribed by William Burroughs to irish photographer John Minihan]. Newtown, Wales: Gwasg Gregynog, 1987. Limited Edition of 275 copies, this being No. 228, designed by John Ryder. Pp. 189 + colophon. 8 watercolours printed by offset-lithography, mounted on tan paper with title and description on verso. Quarter coloured-vellum over taupe paper covered boards, bright gilt-stamped spine lettering extending full length of spine, gilt-stamped publisher's device to front board, top-edge gilt. Bookplate of Robertson Davies to front pastedown. Short, neat gift inscription in Welsh from Margaret Davies, 1988 (RD's step-mother). 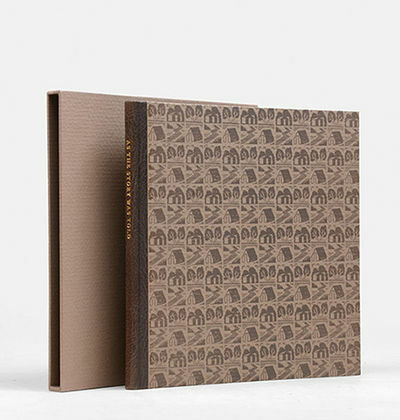 Fine copy housed in a fine plain brown cloth slipcase. Although a later Gregynog item, now becoming quite scarce.. Limited, First Edition. Hard Cover in Slipcase. Fine. Quarto. Norwalk, Connecticut: Easton Press, 1987. Collector's Edition. Full Leather. Near Fine+/No Jacket as Issued. 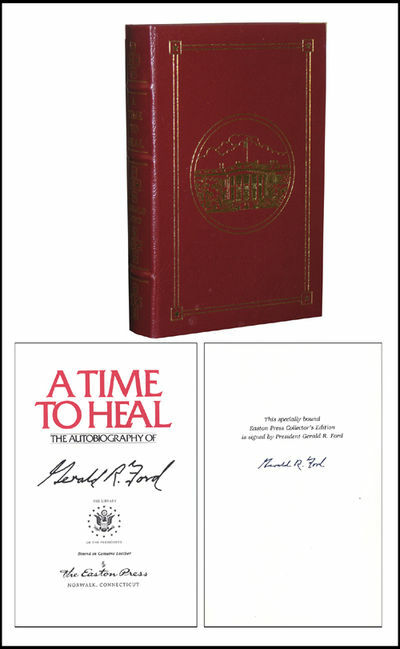 A handsome red leather Limited Collector's edition of the autobiography of former U.S. President Gerald Ford, signed by President Ford. An edition of the Easton Press "Library of the Presidents" series. 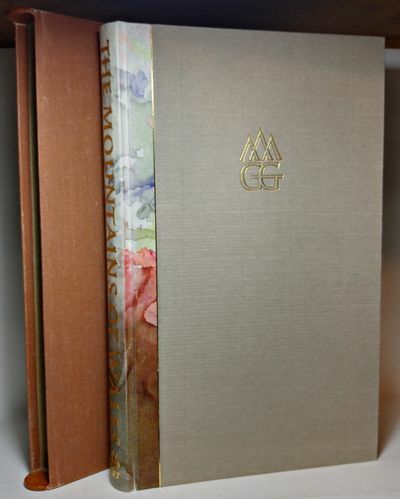 With 24K gold-gilt cover designs and page edges, bound-in silk bookmark. In fine unread condition, square and solid, but for two very small marks on the gilt edge, very minor. Includes an unattached bookplate and publisher's pamphlet from Easton Press with Introduction by Henry Kissinger. The story begins on August 1, 1974 with a phone call from White House Chief of Staff, Alexander Haig, to discuss the growing Watergate crisis and political problems of then President Richard Nixon. A fascinating book and a rare and important autograph from the late President. Verona: Kulgin D Duval and Colin H Hamilton, 1987 A pristine copy of the most beautifully produced book of all of George Mackay Brown's works.The book is the result of a collaboration between Brown and his friend, the renowned photographer, Gunnie Moberg who provided the magnificent pictures of stone. Published as a limited edition of 125 copies signed by the author and photographer. Hand press printed at the Officina Bodoni by Gabriella and Martino Mardersteig. Half leather binding. The book is presented in a dove grey slipcase. An outstanding copy of this rare and magnificent book. The Magical Link (New Series). Vol. I., Number 1. (Jan./Feb. 1987) to Vol. VI, No. 4. (Winter 1992-93). [New York], 1987. 5.75" x 8.75". 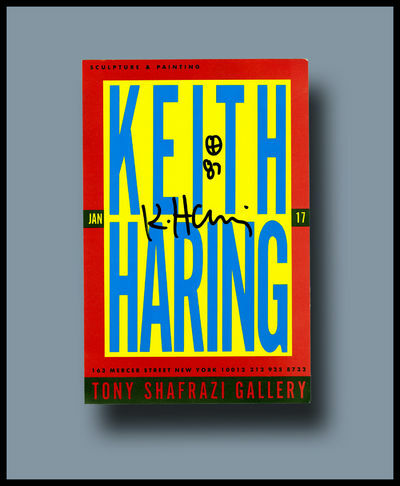 "Rare Exhibition Card Signed ""K. Haring"" beneath his hand drawn trademark, a circled +, and the year ""87."" Color, 5.75"" x 8.75"". Color close-up of a Haring work on art on verso. Fine condition. ""KEITH / HARING"" in upper case lettering in a 4.75"" x 7"" rectangle in the center, ""JAN"" at its left, ""17"" at its right."" Captioned at top edge ""Sculpture & Painting"" and at bottom edge ""163 Mercer Street New York 10012 212 925 8732 / Tony Shafrazi Gallery.""" Cambridge: The Rampant Lions Press,, 1987. Quarto. Original quarter morocco, brown patterned boards, title to spine gilt, printed endpapers with manuscript facsimiles. Housed in the slipcase, as issued. Text printed in black and red on pale yellow paper. A fine copy. First edition thus, signed limited issue. Number 23 of 25 copies signed by Samuel Beckett, from an edition of 325 copies. Transcribed by Christopher Ricks (Professor of English at Cambridge at the time), this edition contains, as well as the published text, variant readings from the various stages of composition and parallel passages from other works by Beckett interwoven. It was originally published in German in 1973, as a contribution to GÃ¼nter Eich zum Gedachtnis - a memorial volume for the German poet and radio playwright, GÃ¼nter Eich, and first published in English in 1984 in Beckett's Collected Shorter Prose 1945-1980. Luther, Manfred. - Cogito ergo sum. - Kreis. - "Alles Vergängliche ist nur ein Gleichnis". Vacuoles. Avec un dessin original signé et trois gravures originales de DADO, signées et rehaussées en couleurs. Bonnier] SALLANDER, HANS. + LINDBERG, STEN G.
Nils Bonniers boksamling. Med en studie över bokbanden av Alf Liedholm. + Nils Bonniers boksamling. II. Nyförvärv 1973-1986. Förteckning. This Side of the Truth. Der Teil der Wahrheit. Zehn Lithografien von Johannes Heisig zu Gedichten von Dylan Thomas. Heisig, Johannes - Thomas, Dylan. Schatten. Mit drei bisher unveröffentlichten Holzstichen von Fritz Eichenberg aus dem Jahre 1944. Easton Press. Hardcover. 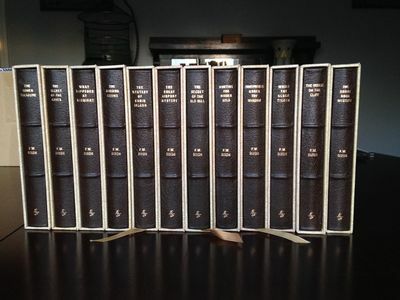 B003ZMDQ10 The Complete Easton Press, 12 Volumes, Hardy Boys Set. BRAND NEW condition! All bound in Full dark brown leather bindings, original pictorial endsheets, all page edges gilt, and pictorial original replica slipcases. A beautiful collection. Printed in 1987. Contains the following titles: 1. The Tower Treasure. 2. The House on the Cliff. 3. The Missing Chums. 4. The Secret of the Old Mill. 5. The Mystery of Cabin Island. 6. The Secret of the Caves. 7. The Shore Road Mystery. 8. Hunting for Hidden Gold. 9. What Happened at Midnight. 10. Footprints Under the Window. 11. The Great Airport Mystery. 12.While the Clock Ticked. NO bookplates or signs of prior ownership! . Fine. 1987-01-01. Bibliothek des Mittelalters. Texte und Übersetzungen. (7 Bde. [von gesamthaft 24 erschienenen Bänden]). Werke in fünf Bänden. (5 Bde. ; komplett). Nebelland hab ich gesehen - Nebelherz hab ich gegessen". Gedichte aus "Anrufung des großen Bären". Siebdrucke, Malereien, Zeichnungen, Collagen, Objekte (Unikate) mit Papieren, Pappe, Holz, Glas und Stoff von Albert Merz. [ Covelo, CA]: The Yolla Bolly Press, 1987. Oblong folio (30.5 x 35 cm). Open-sewn Belgian linen over boards. Illustrations. Bookplate on front pastedown, otherwise fine in slipcase with small patch of label residue at corner of one panel. First edition in this format, with a Foreword by Ursula K. Leguin, and illustrated with color woodblocks by Karen WikstrÃ¶m. 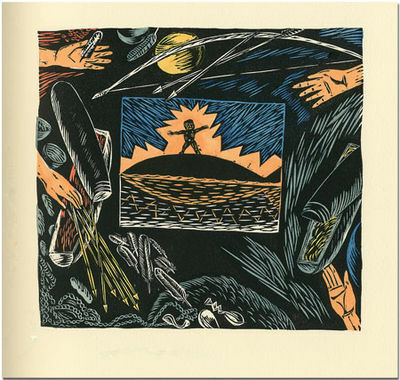 One of 115 numbered copies (of 135), printed on Rives BFK Cream, with the woodcuts printed from the blocks and colored with gouache paints applied by hand from stencils cut by the artist. Signed by the artist. With a printed slip prepared by the press for the original subscriber to this copy laid in. A superb edition of this collection of Pacific Coast Native American tales, first published in 1959 by Indiana University Press, with an introduction by Oliver LaFarge. New York: Doubleday, 1987. First edition. Octavo, original red cloth. 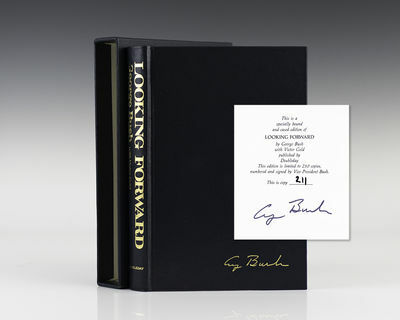 Signed by George Bush on the front free endpaper. Fine in a fine dust jacket. 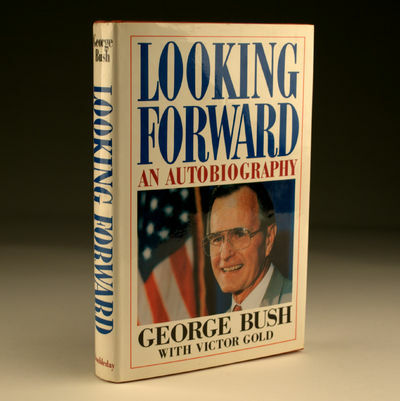 In this autobiography, written by a Vice President while still in office, George Bush looks at his previous career, from navy pilot in World War II to his financial success in the Texan oil fields in the 1950s. He then served three Republican presidents and survived encounters with Democratic Presidents Johnson and Carter. This book throws light on his years as congressman, UN Ambassador, Republican National Committee Chairman during Watergate, envoy to China and Director of the CIA. Bush also discusses the failings he believes led to the Iran-Contra affair. He offers anecdotal views on international figures - Reagan, Nixon, Kissinger, Mao, Gorbachev and Thatcher, and reveals the political issues he is championing for the presidency of the United States. The Life of My Choice. SIGNED and WITH AUTOGRAPHED LETTER. Mr. Joseph Beuys makes the world Documenta 8. Sheet black paper, wrinkled (as issued), with the text line printed in gold. No date (1987), paper size ca. 19 x 25 cm. *In orig. black paper envelop (backside somewhat damaged due to uncarefully handling), addressed in gilt handwriting (HIS OWN!) with sender Byars / Stedelijk Van Abbemuseum / Bilderdijklaan 10 / Eindhoven / Holland and with almost unreadable post stamp. - See Schraenen, Bücher etc. 129. 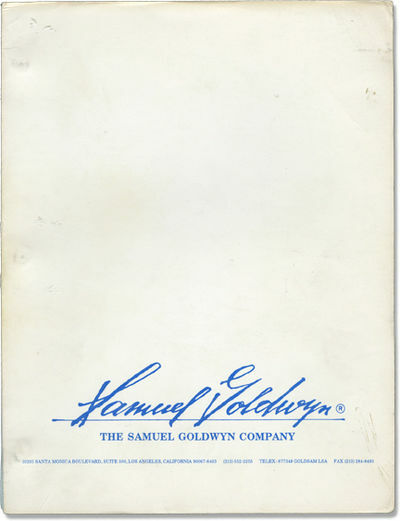 Los Angeles: The Samuel Goldwyn Company, 1987. Final script for the 1988 film. A seminal coming-of-age film that proved to be the launchpad for its three stars (Julia Roberts, Annabeth Gish, and Lili Taylor), all of whom would go on to have significant and very different careers as actresses. The three play teenagers who all work at a pizza shop in Mystic, Connecticut, all facing life and love choices with a host of frustratingly obtuse male candidates. Rainbow copy. White -and-blue titled wrappers. Title page present, with credits for screenwriters Jones, Howze and Howze, and Uhry, with a guide to the various colored revision pages. 150 leaves, some photographically reproduced and some dot-matrix, with revision pages in 16 colors throughout, dated variously between 9/18/87 and 11/2/87. Many "omission" pages are present, as well as omissions denoted with holograph marker in various colors, as a diagonal line at the top right corner of the page. Pages Near Fine, wrapper Very Good plus, internally bound with three gold brads. New York: Doubleday Press, 1987. First edition, signed Limited edition. Octavo, original blue leather, all edges gilt. One of 250 numbered copies, signed by George Bush. Fine in a fine slipcase. In this autobiography, written by a Vice President while still in office, George Bush looks at his previous career, from navy pilot in World War II to his financial success in the Texan oil fields in the 1950s. He then served three Republican presidents and survived encounters with Democratic Presidents Johnson and Carter. This book throws light on his years as congressman, UN Ambassador, Republican National Committee Chairman during Watergate, envoy to China and Director of the CIA. Bush also discusses the failings he believes led to the Iran-Contra affair. He offers anecdotal views on international figures - Reagan, Nixon, Kissinger, Mao, Gorbachev and Thatcher, and reveals the political issues he is championing for the presidency of the United States. Il vernacoliere. Mensile di "vernacolo satirico livornese e toscano", poi "satira, umorismo e mancanza di rispetto in vernacolo livornese e in italiano". Livorno, 1987/2000, quattordici annate di 24 fascicoli di pp. 32 cad. rilegati in sette volumi, tutta tela colorata (giallo/arancio). New York: Vincent Fitzgerald & Company, 1987. Quarto. Full handwoven decorative cloth over boards. Illustrated with original colored etchings and a four panel gatefold three- color lithograph. Faint bookplate shadow on front pastedown, otherwise fine in silk- covered gilt-stamped folding clamshell box (lower fore-tip rubbed, small sticker shadow in lower corner of upper panel). 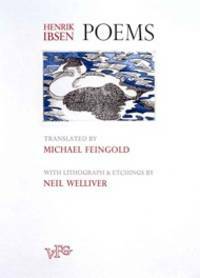 First edition of these translations by Michael Feingold, accompanied by a translator's Foreword, illustrated with five colored etchings and a lithograph by Neil Welliver. One of seventy-five numbered copies, from an edition of ninety-five copies printed by Daniel Keleher of Wild Carrot Letterpress on handmade Dieu DonnÃ© paper. The etchings were printed by Shigemiotsu Tsukaguchi, and the lithograph at Blackburn's Printmaking Workshop. The handwoven fabric for the cover was made by Sara Dochow. Songs by George Harrison, Volume 1 and Volume 2. Guildford: Genesis Publications Ltd 1987-1992., 1987. 2 volumes, SIGNED LIMITED EDITION. With additional text by Ringo Starr, Elton John, Harry Nilsson and Jeff Lynne. 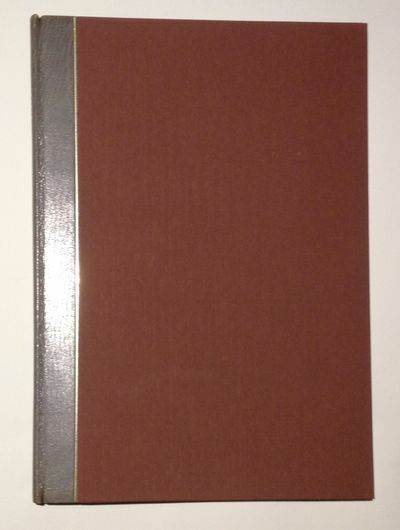 Quarto, with colour plates and illustrations by Keith West. Original black half-morocco boards, gilt edges, with limited edition CD 'Songs' and 'Songs 2', the whole contained in custom-made clamshell boxes with a card tray. Limited to 2500 copies, both books signed by the former Beatle. A fine production, as expected from Genesis, the pioneers of high quality art-rock publications. 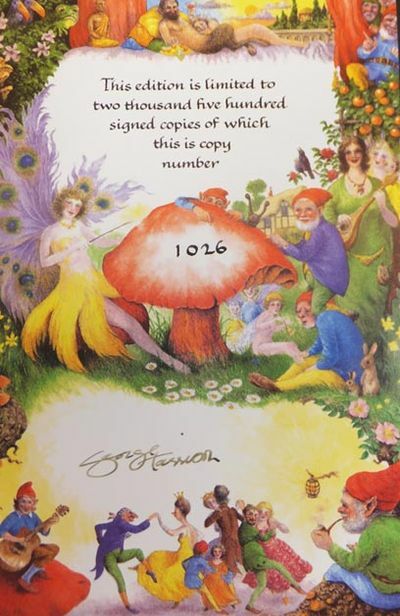 The 'Songs' contained within are illustrated by talented New Zealand botanical artist Keith West, who impressed George Harrison with his wealth of fantastical imagery. Random House, 1987. Hardcover. Fine/Fine. Random House, New York 1987. First Edition / First Printing. First Edition stated on the copyright page. 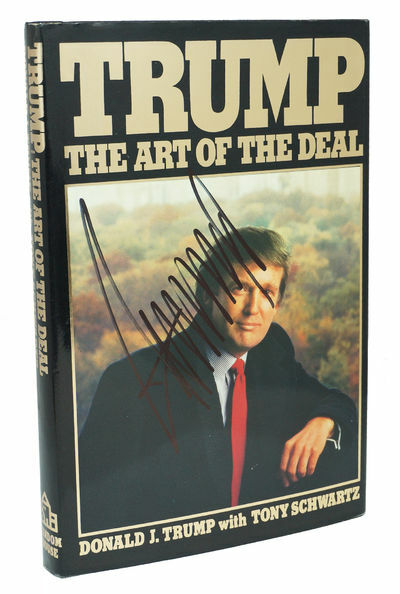 Signed by Donald Trump on the front panel of the jacket. The Signature is Guaranteed Authentic. Cloth boards. Illustrated with photos. Book Condition: Fine, clean boards and pages, tight spine. Dust Jacket Condition: Fine, soft shelf wear. Wrapped in a new removable mylar cover. Morgner, Michael. - "Das Schweigen". New York: Harcourt Brace Jovanovich. Fine in Fine dust jacket. 1987. 1st US Edition; First Printing; Signed by Author. 1/4 Cloth. 0151759200 . A fine first printing of the 1st American edition in equally unblemished dust-jacket. Signed by author and Nobel Laureate GÃ¼nter Grass directly on the front fly leaf ; First published in Germany in 1986 under the title "Die RÃ¤ttin" by Nobel Prize winner, GÃ¼nter Grass. 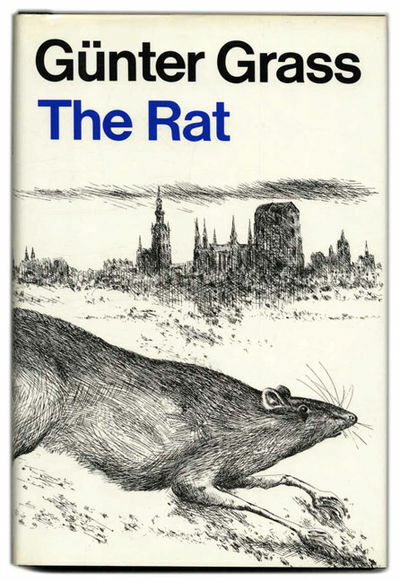 "And the rats shall inherit the earth, or so Grass concludes in this wonderful work of speculative virtuosity. With no less a subject before him than the ultimate fate of humankind..." (from Library Journal) .